Printer in Prague between 1612 and 1628; son of Simeon Haida. In 1610, with Moses Uṭiẓ and Gershon Popers, he assisted in the printing of Samuel Laniado's "Keli Ḥemdah." In 1612 he was associated with Moses Uṭiẓ in the printing of Manoah Hendel's "Manoaḥ Maẓa Ḥen." He also printed the following works: Immanuel ben Solomon's "Maḥberet ha-Tofet weha-'Eden" (1613; according to Steinschneider); "'En Mishpaṭ" (Steinschneider, "Cat. Bodl." No. 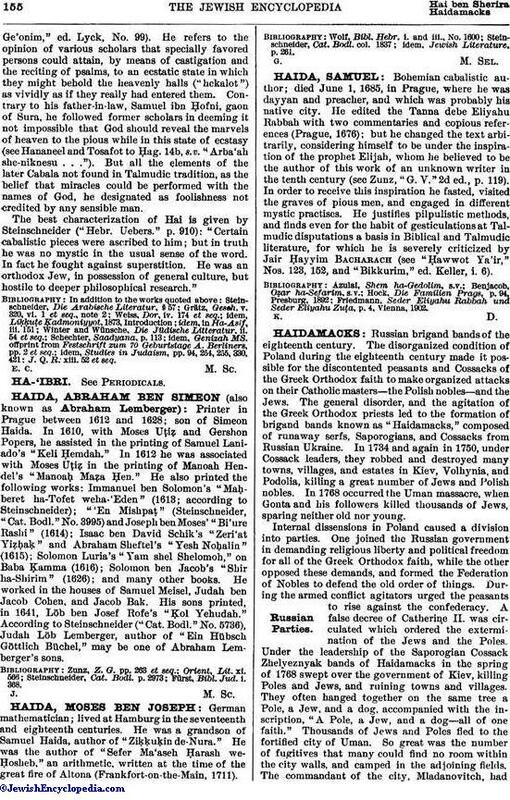 3995) and Joseph ben Moses' "Bi'ure Rashi" (1614); Isaac ben David Schik's "Zeri'at Yiẓḥaḳ" and Abraham Sheftel's "Yesh Noḥalin" (1615); Solomon Luria's "Yam shel Shelomoh," on Baba Ḳamma (1616); Solomon ben Jacob's "Shir ha-Shirim" (1626); and many other books. He worked in the houses of Samuel Meisel, Judah ben Jacob Cohen, and Jacob Bak. His sons printed, in 1641, Löb ben Josef Rofe's "Ḳol Yehudah." According to Steinschneider ("Cat. Bodl." No. 5736), Judah Löb Lemberger, author of "Ein Hübsch Göttlich Büchel," may be one of Abraham Lemberger's sons. Fürst, Bibl. Jud. i. 368.